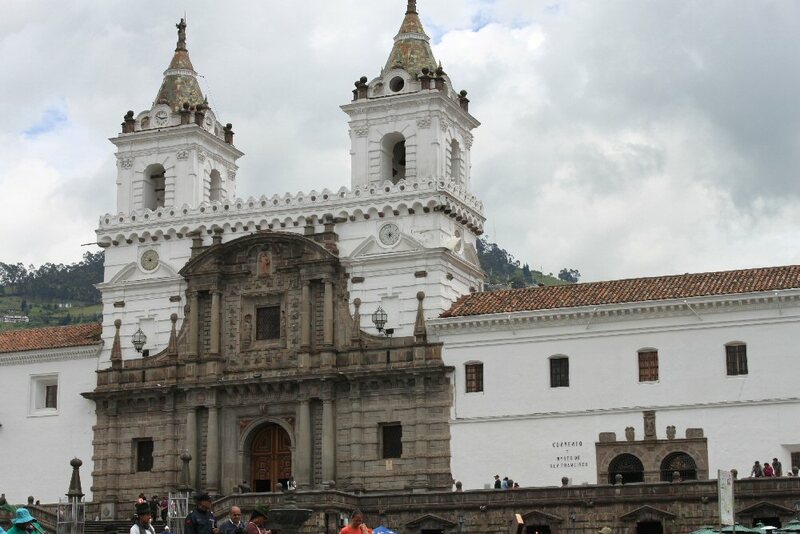 Quito, the capital of Ecuador, sits at an altitude of around 9,000 feet. To combat altitude sickness, we were advised to drink lots of water and there was plenty of bottled water available from our tour guides. We did well, only occasionally feeling a bit light headed and of course short winded when it came to doing any stairs. 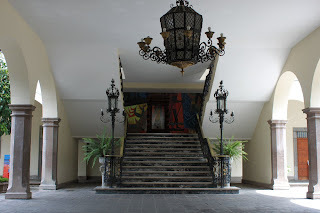 As we waited in the lobby of the Marriott for everyone to gather for our day exploring Quito I noticed large arrangements of roses everywhere. A fresh rose had even been laid on our bed last night. So many roses. . .and then I remembered. When I had the flower shop, all the roses we bought from the suppliers came from South America. Later we would see roses for sale: 25/$1! 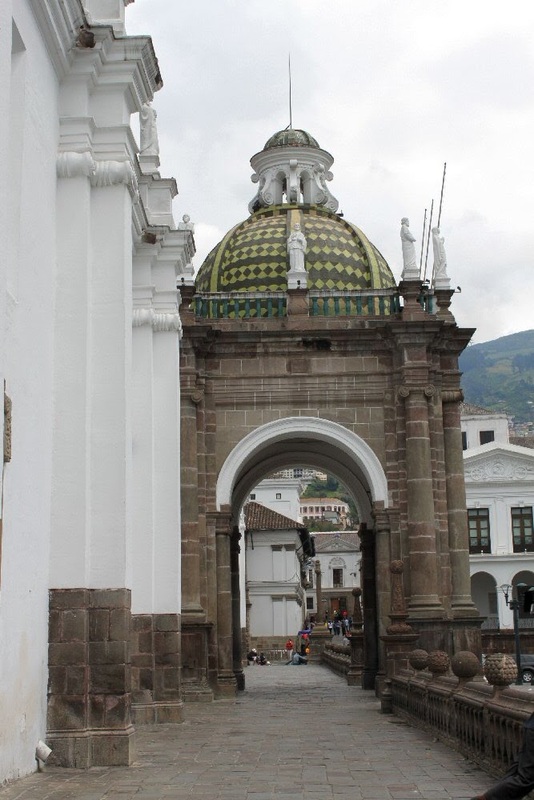 Our morning was spent strolling the streets of Quito in the old town after a stop high above the city at La Basilica. We stood outside and admired the facade full of animals and birds of Ecuador. While there, we were approached by a handful of vendors. Our guide told us they were from an indian tribe in the area that sells hand made good among other things. Several ladies had a pile of brightly colored scarves folded over an arm. 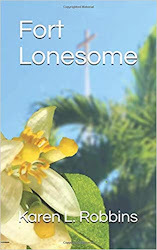 Each lady wore a green felt fedora with a feather in the hat band. 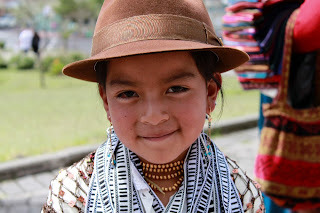 With them was a beautiful little girl who was selling handmade purses for a $1. I asked if she would let me take her picture for $1 instead and she and her mom agreed. Back on the bus, we drove through the narrow streets of old town to a drop off point. The traffic was horrendous. It was Sunday and I wondered if it was worse on weekdays. We made it down to Independence Square, the central plaza of the old city. People congregated and lingered in the square, some of them listening to street preachers and one or two orators with political views. 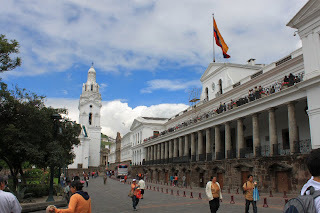 The Presidential Palace took up one side of the square, the Cathedral of Quito and a museum another, the Archbishop's Palace and a grand hotel a third side and the remaining side was shops and restaurants. We entered through a doorway into the commercial area of the Archbishop's Palace to see a couple of courtyards. Along one side was a restroom for those in need and I think that was more the reason for stopping there. 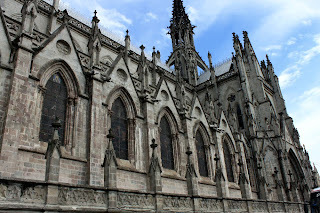 Our group crossed the square to the Cathedral which was built in the middle 1500s and walked along the front of it. 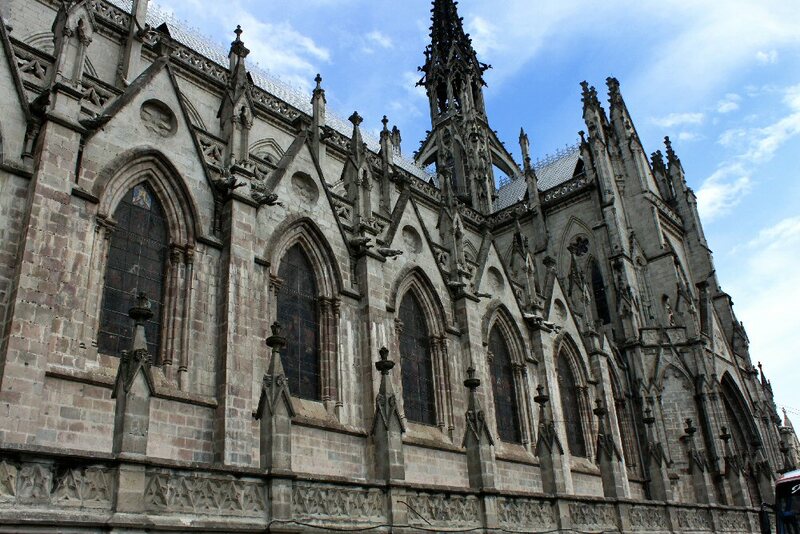 It had suffered from several earthquakes and had been renovated several times. The domes were painted tiles which were a unique style of architecture. 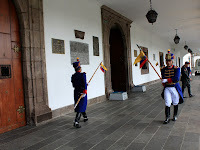 Crossing the street at the corner, we were able to go through the gate to walk the length of the Presidential Palace and were just in time to see the changing of the guard. As a matter of fact, I almost became a part of it as I got a little too close and was nearly speared by the end of a flag pole. 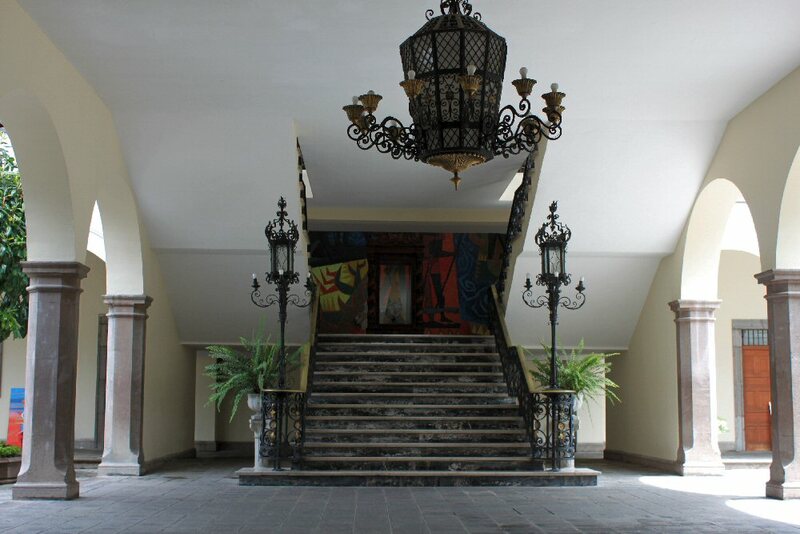 Just inside the entryway, we were able to view a lovely courtyard split by the main staircase into the palace. 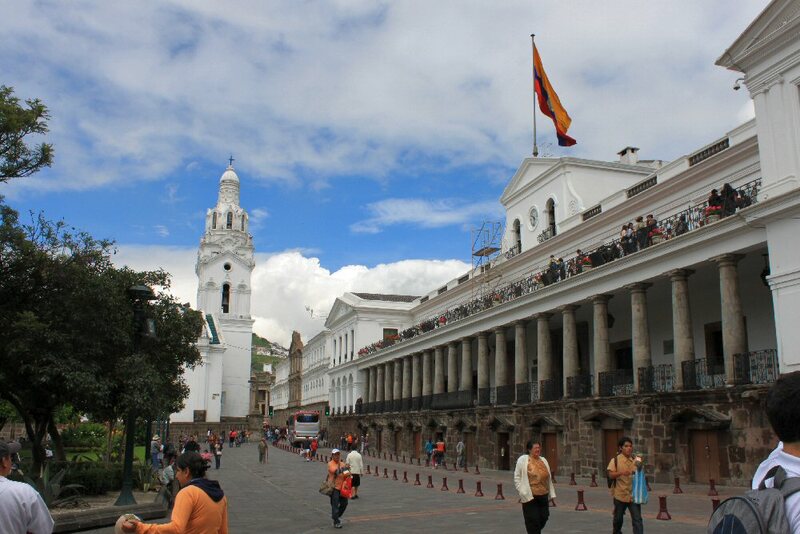 The top floors are occupied by the president of Ecuador and the lower levels are for governmental purposes. There are tours that can be had to see some of the inside. 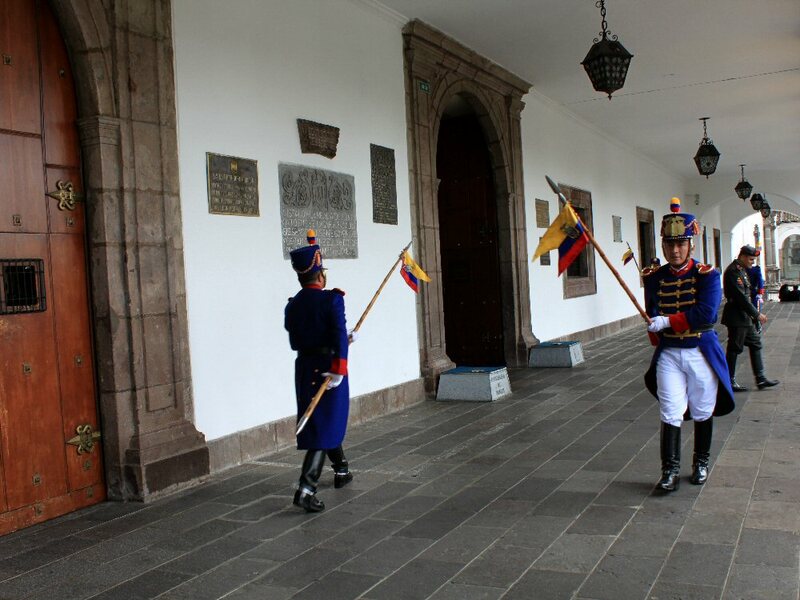 On a wall in the entryway, was the emblem or seal of Ecuador. It featured a condor and from then on every time that our guide told us a distance, he ended by saying, “As the condor flies.” Clever. Around the corner from Independence Square is the Church of San Francisco. It is not only a church but a monastery and museum as well. We climbed steps up to a balcony overlooking the sanctuary to see the amazing ornate decoration. Most of it was gilded in gold. We could not take any pictures because too many others in the past had used flash rather they meant to or not and there were services going on. 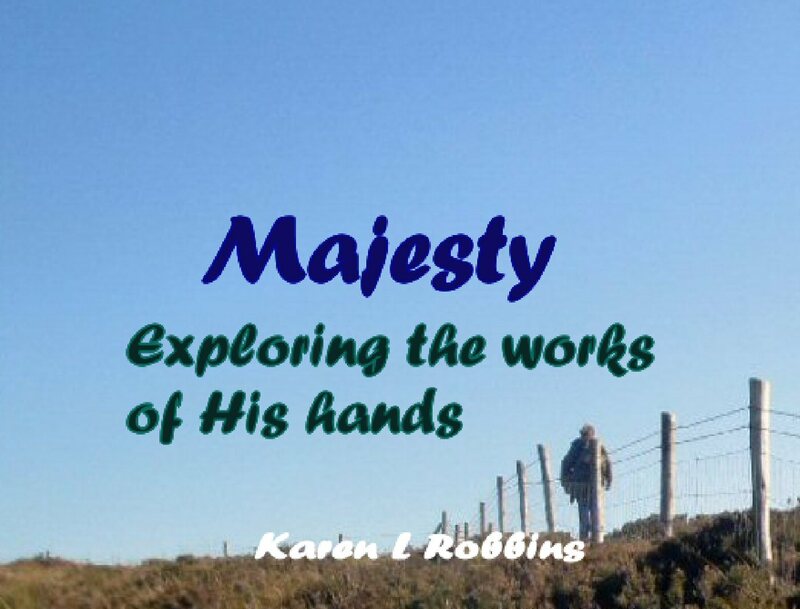 was full of wonderful statues, many that had been used often in religious parades years ago for special festivals. Noon arrived and we were escorted to our mini bus for our trip to the restaurant for our lunch. My growling stomach agreed that it was time.